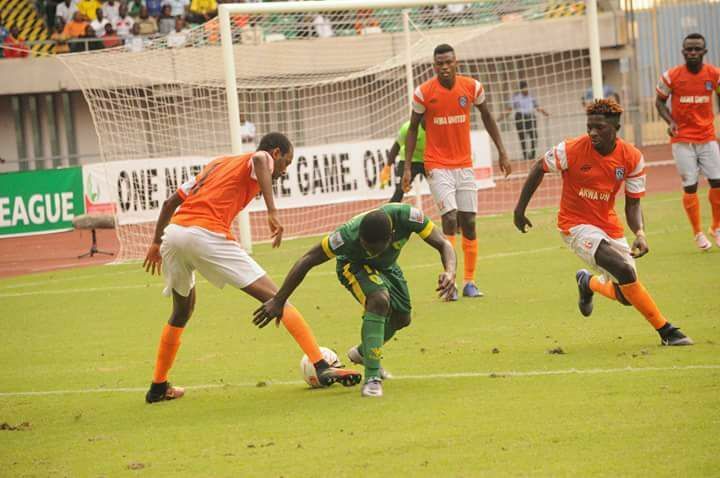 Akwa United labored under the heat of the weather to grab all three points against Yobe Desert Stars in Damaturu on matchday 7 of the 2019 Nigeria Professional Football League. Mfon Udoh’s effort in the 29th minute was the difference between both sides after Etboy Akpan had set up the record league goal scorer for his third goal of the season. The former Enyimba captain did not hesitate to head in Etboy’s pin point cross minutes after his fellow statesman, Daniel Udoh at the other end almost turned in the ball for an own goal against his team due to the intense pressure mounted by Akwa in the early stages. After a moral boosting 3-0 win at home against Go Round FC in Uyo during the weekend, Coach Rafael Everton decided to stick with the formation and starting lineup which earned him his first league victory as gaffer of the two-time FA Cup winners. Few minutes into the encounter, Udoh’s strike partner Ndifreke Effiong took a long-range effort which demanded Goalkeeper Paul Godwin who was off the line to rediscover himself to keep the scoreline level. Shortly after Mfon nicked in his third of the season, Cameronian International, Jean Efala was called to action in a one on one encounter with Abdullahi Usman who succeeded in beating Akwa’s offside trap but failed to put the ball past Efala who pulled out a save from the hat to ensure the visitors held on to their lead. Before the end of the first half, Goalkeeper Paul’s poor clearance fell nicely at the centre of the eighteen yards box for Olisema, but the midfielder’s shot went narrowly wide. Coming in for the second 45 minutes, the home put more men forward in search for an equalizer, thereby opening up spaces for the Promise Keepers for several counter attacking attempts which ended futility. T o fortify the lead, Christopher Lolo was replaced by Ahlan Cup teenage sensation Ubong Essien while Etboy Akpan, who capped his fine game with an assist was later replaced by by Juwon Oshaniwa few minutes before the final whistle. In the closing stages of the encounter, the home side had a ball in the back of the net which was rightly called back for a foul in the buildup towards the goal. The 2017 Aiteo Cup champions who have one outstanding game at hand are now 7th placed on the log in Group B and will face newly promoted side, Kada City on matchday 8 at the Nest of Champions on Sunday.